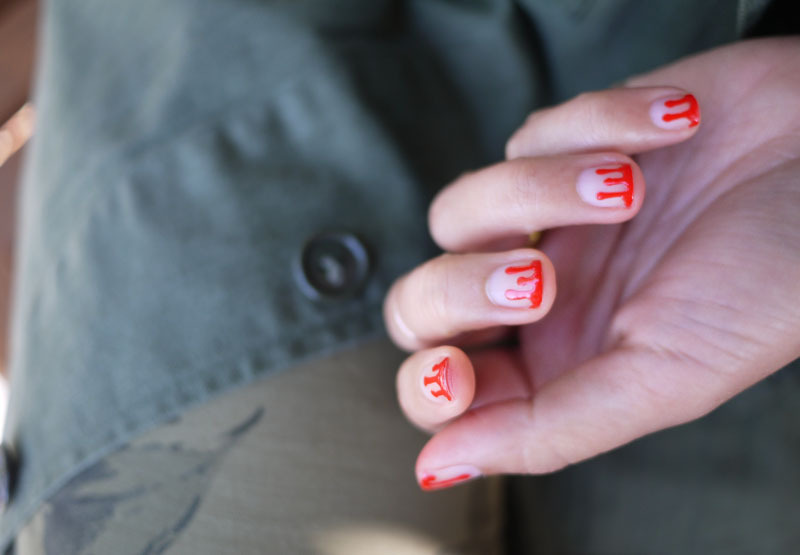 We were immediately inspired the moment we saw bare nails with blood-like, drippy polish accompany Prabal Gurung‘s spring collection at New York Fashion Week. 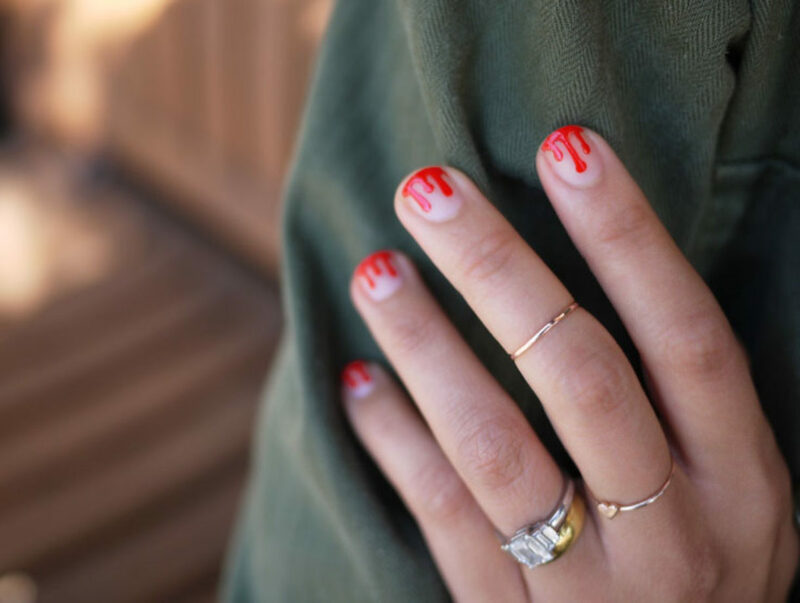 Halloween is one of our favorite holidays and thus, the timing couldn’t have been better to recreate this deliciously daring DIY for our phalanges. Though a more vampy, burgundy color went down the runway, I went for more vibrant red . . . but the best part about this tutorial is that you can make it your own with just about any color, for any season! 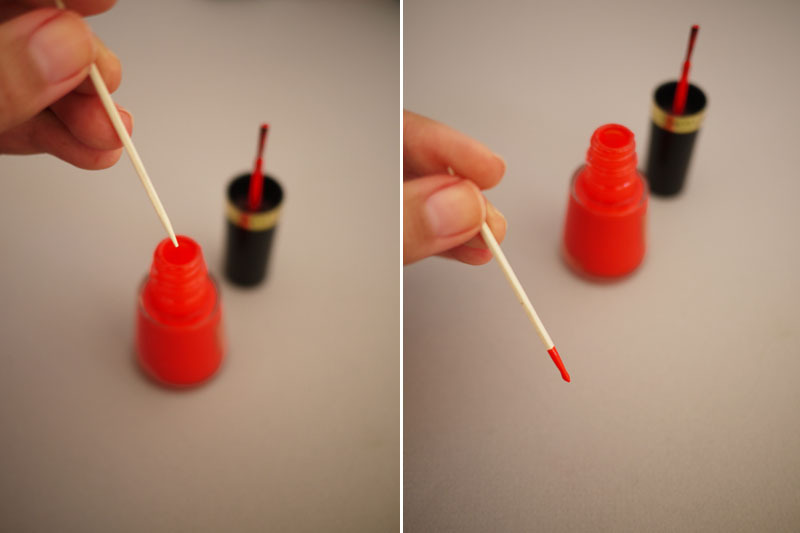 Dip the toothpick into the nail polish bottle so that the tip collects a round bead of polish. 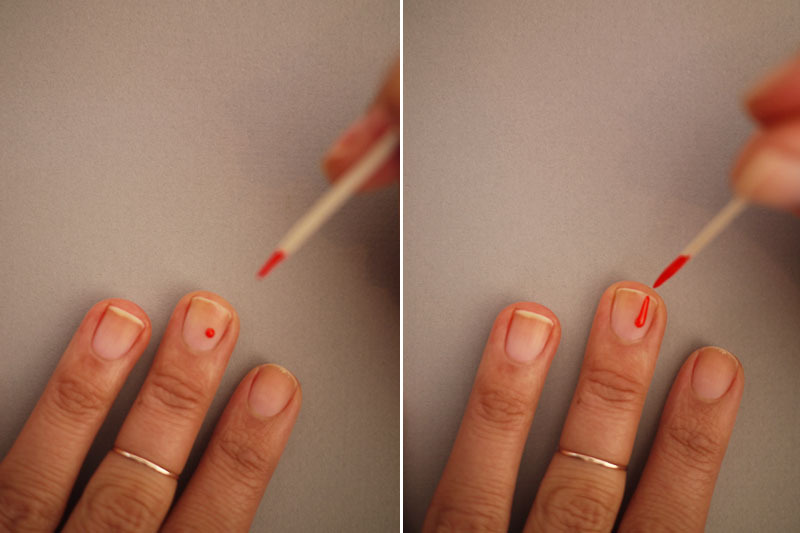 Place the bead of polish on a bare nail and drag it upwards, creating a tapered line. 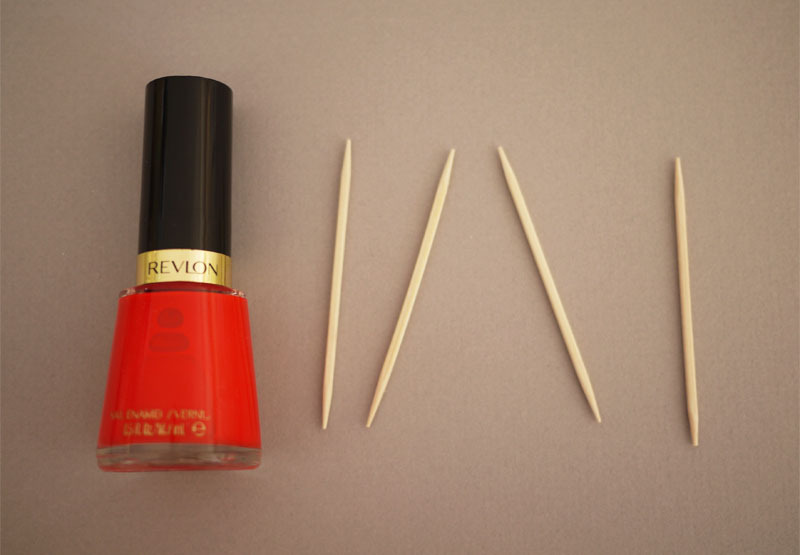 Create two to three more tapered lines, re-dipping the toothpick into the polish each time. Reload the toothpick with polish and drag a line across the tip of the nail. Go back and soften the curves between the tops of each “drip” with the toothpick. Repeat the steps on the other nine fingers and voila, you’re done!! I love it!!! it’s very fun!! WOW!! Cool idea. Absolutely gonna try. AMAZING! I can not wait to try doing this for Halloween! Thanks so much for always inspiring! Yes!! This is perrrrfect. Italians don’t celebrate Halloween and they might look at me strangely, but “honestly wtf”, I don’t care! sooo gonna do this for Halloween! Love that you did this – so clever. This is cute and perfect timing for Halloween. I’m going to try it. I’m not the only one to think this totally perfect for Halloween – can’t wait to try this look! And I love love love the look of the rings on your middle finger! It looks so easy! Trying this for Halloween. I tried this a couple of months ago using white as the top colour for a wet paint french manicure look which looks great too! 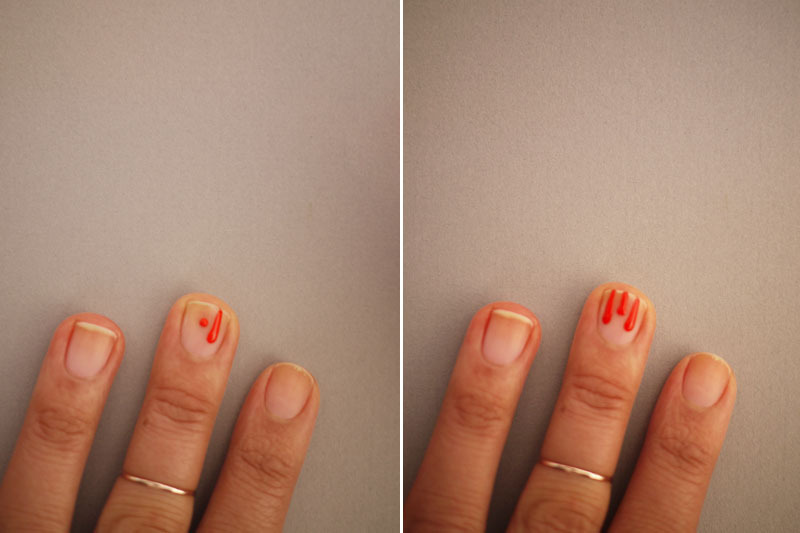 I saw this nail art in the latest issue for ASOS magazine, but they used pens, so I’m so pleased you explained how to do it with toothpicks…love it! That is GREAT and looks so easy!! Thanks for the fun tip! I used to do this in high school and most of the kids thought that it was freaky…guess i was just waaaay ahead of my time 😉 Love your rings btw! Yikes. Really? Halloween maybe, but every day nails? Me thinks not. Really cool and original, i’m gonna try it for sure!!! Your engagement ring is stunning! That is my dream ring. The nails are awesome too. Really cool! I love it! i have the perfect shade of red! can’t wait to try it out! So creative, I will try iiiiit !! Sorry, honey, it should be drippin’ from the cuticles. You got it upside down. Been dreaming about the look.. can’t wait to do it myself! Thanks for the motivation boost! 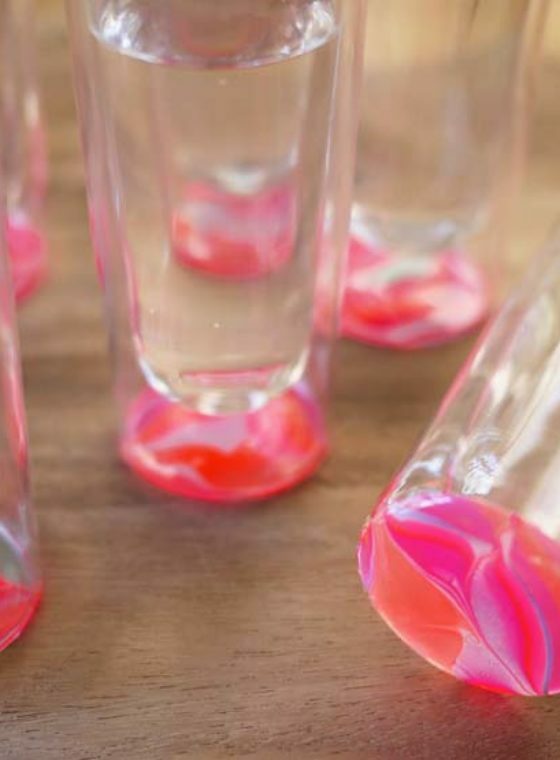 These are kinda awesome — I bet they’d look even creepier with a pale pink base. The red would REALLY stand out. Sooooo funny!! Must try this! Holy mack! 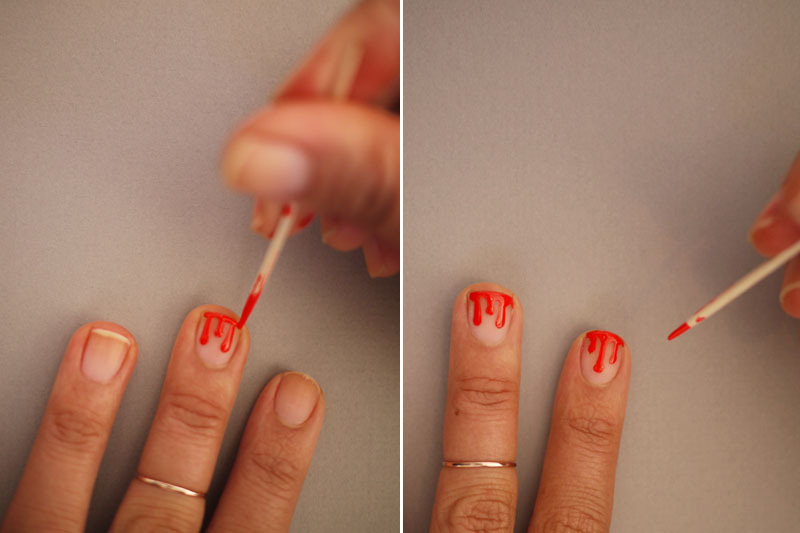 The best Halloween manicure ever! Haha that’s an awesome Halloween nailairt 🙂 It almost looks real haha ! Ok that is so cool, definitely trying that! Such a smart and pretty idea!! Will be trying that out like, now. Just tried it with a deep red. Super easy, a great look. I’m going to try it in black next week and a bright pink after that. Think I’ll sprinkle some glitter on the pink! I’m never really a nail polish person, but I tried this and I love it! I tried your nail tutorial this weekend and posted a picture of it on my blog! Really impressive yet so simple! Thats what makes it unique i suppose. Ill be trying this one! Wow gothic 😀 I like it. That is brilliant! Totally trying this! Great tutorial! I’ll remember this next time I want to get creative with my nails.. maybe for Halloween. OMG i am sooooo gonna wear this for this coming halloween! i am totally obsessed! What a great idea! I tried it myself in black but I think yours turned out better. Good one. Will try to make it today with different shades. amazing !! and your rings too ! I love your site! I think I have told you that before but your post are so interesting… Your on my blog-lovers list. Okay, back on to topic….. the nails are awesome! I wish I would have seen it BEFORE halloween though! Darn it! Take a peek at my place, http://www.borntobeblonde.com! Nice! I think I’l try this. I love your ring with the tiny heart, it’s so cute! do someone know where did you get this heartring from ? My nails are becoming yellowish. Need good suggestions. Wow! They’re so cool and super cute! Never thought that they’d be that easy to do! Stumbled upon this had to try it right away! Very cute and so simple! I love that it looks like it took a ton of effort haha! 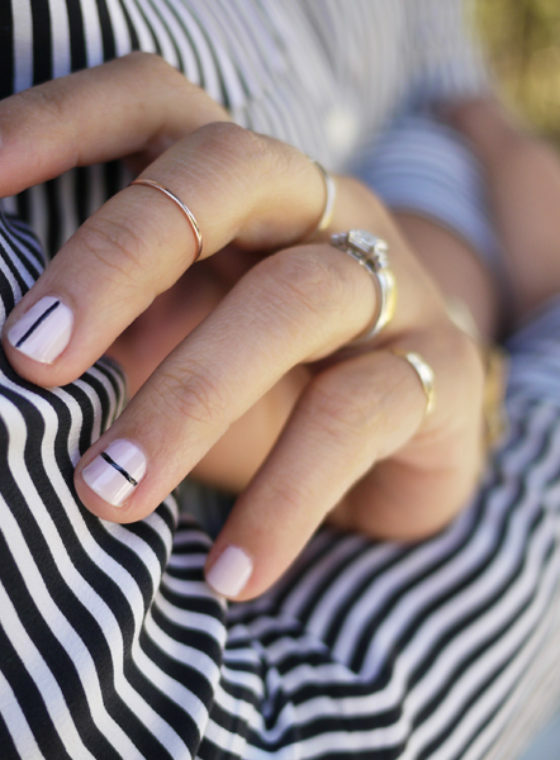 your blog ist wonderful….an the nails a very nice….and i discovered your rings…. I see for 2 years the small ring (whith heart) in vienna, (i hope that is the same manufacturer) where can i buy this rings? Do you have the name of the company? 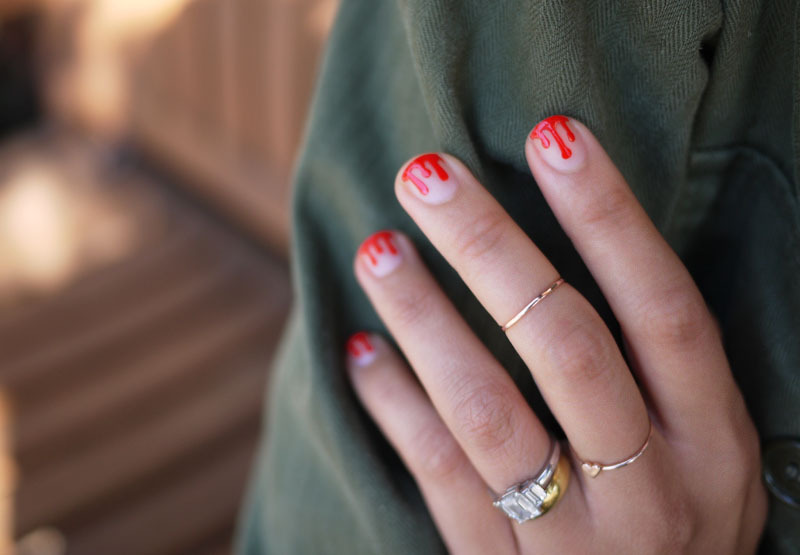 ok i’m a nail blogger and never bothered to figure out how to do this. every time i saw it, i would actually wonder how these girls did it!! my friend just sent me your link – love the tutorial. thanks for posting!!! I like it..tnx so much. I tried this and failed horribly. Thank god for nail polish remover. OMG this is such a cool idea. Going to try it. Great ! Really impressive yet so simple! Thats what makes it unique i suppose.ll be trying this one!